Newcastle returned to the top of Pool 1 in the Challenge Cup with an eight-try demolition of Bordeaux-Begles. 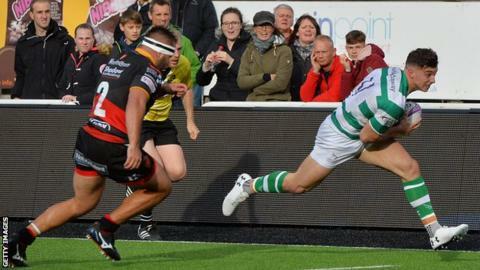 The result was quickly beyond doubt as winger Adam Radwan scored two of six first-half tries, with Calum Green, Mark Wilson, Ben Sowrey and fly-half Craig Willis also going over. Alex Tait and Joshua Matavesi added second-half scores for the Falcons. Bordeaux-Begles replied with tries from Yann Lesgourgues, Matthieu Jalibert and Geoffrey Cros. The defeat leaves the French side having to beat Enisei-STM next week to retain any hope of qualifying for the quarter-finals. Newcastle are in control of the pool after a third straight win and could confirm their place in the last eight with victory over Dragons on Friday. Newcastle Falcons: Hammersley; Tait, Penny, Matavesi, Radwan; Willis, Stuart; Lockwood, Sowrey, Wilson, Green, Witty, M. Wilson, Graham, Burrows. Replacements: Blamire, Vickers, Davison, Young, Orr, Hodgson, C. Wilson, Kibirige. Bordeaux-Begles: Ducuing; Cros, Uberti, Lonca, Fuatai; Jalibert, Lesgourgues; Taofifenua, Pelissie, Cobilas, Jones, Cazeaux, Diaby, Roumat, Houston. Replacements: Avei, Paiva, Poux, Gayraud, Woki, Doubrere, Volavola, Rey.